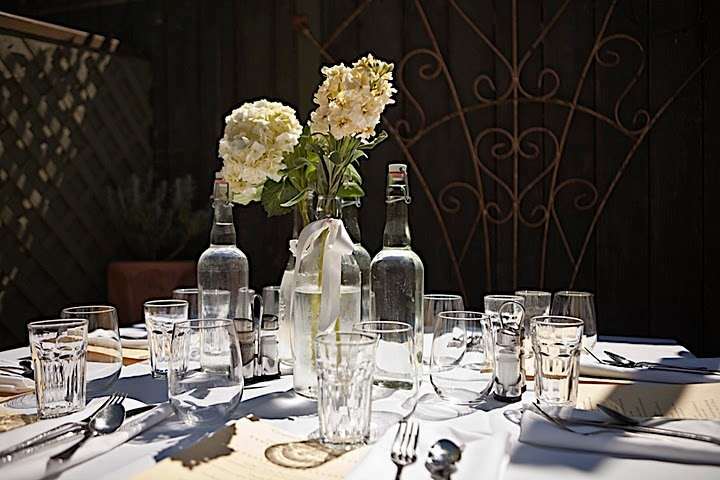 Our neighborhood French bistro in a historic school house in the heart of San Francisco is the perfect place to host rehearsal dinners, weddings, birthdays, and all celebrations! The brick walled dining room with towering skylights can accommodate 45 guests, and the heated, covered garden patio seats up to 40 additional guests, for a total capacity of 85. We offer dinner parties nightly, as well as weekday brunch events. 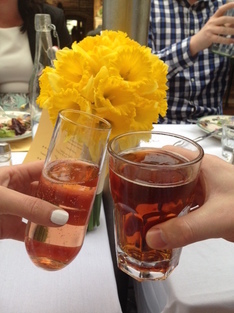 Zazie has been serving Cole Valley for 25 years and we're thrilled to have been a part of many neighborhood celebrations. Like all our pricing, large party pricing includes service; no space rental, party planning, equipment rental, or gratuities will be added. while drinks are simply charged by consumption. Sorry, but we simply cannot accept any weekend or holiday brunch reservations; it's simply too busy to hold tables. ​For more information on brunch parties, click here. (5:00 or 8:15) or you can reserve the tables for the entire evening for an increased food & beverage minimum. then serve salads, appetizers, and entrees family style. ​cake while guests mingle and dance. For more information on dinner parties, click here.